We consider the problem of packing several convex polygons into minimu, size rectangles. For this purpose the purpose the polygons may be moved either by translation only, or by combinations of translations and rotations. We investigates both cases, that the polygons may overlap when being packed or that they must be disjoint. The size of a rectangle to be minimized can either be its area or its perimeter. In the case of overlapping packing very efficient algorithms whose runtime is close to linear or O (n log n) can be found even for an arbitrary number of polygons. Disjoint optimal packing is known to be NP-hard for arbitrary numbers of polygons. 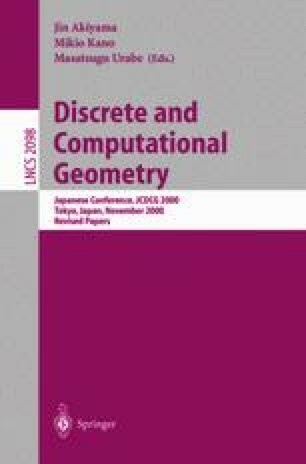 Here, efficient algorithms are given for disjoint packing of two polygons with a runtime close to linear for translations and O (n 3) for general isometries. Partially supported by the German Research Association (DFG), projects A1 253/4-2 and A1 253/4-3. Partially supported by CUR Gen. Cat. 1999SGR00356 and Proyecto DGES-MEC PB98-0933.